RSCDS Toronto is a volunteer-driven organization. Over the years, remarkable people have made valuable contributions to our organization, and to Scottish country dance in general. Read about former winners of Branch Awards, Volunteer Awards, and Scroll of Honour on our VIP page. 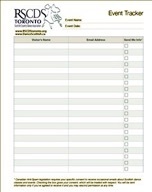 Archive copies of Set & Link, the RSCDS Toronto monthly newsletter, are available here for download, from 2005 to 2012. In addition to these documents, there is a detailed Operations Manual, providing Job Descriptions for each appointed position in the Association. All these documents are compiled into what is affectionately known as “The Yellow Book" as shown above. In 2015, the Board updated The Yellow Book to reflect changes made to our organisation over the past few years. This revised version is now completed and available to all of the membership by clicking on the image above. Use this form to collect attendance and contact info at every demo, ceilidh, or similar outreach event and forward to Catherine MacLean. RSCDS Toronto periodically offers Teacher Candidate training. This page explains the process. The info posted is a bit out of date but still a valuable guide to those who may be interested in becoming a certified teacher of Scottish country dance. A separate page details the criteria and process to be considered for a scholarship of up to $500. The RSCDS Toronto Association Annual General Meeting will be at Crescent School, during the interval of the dance that evening. MOTION: Be it moved that that revisions to the Procedures Manual as presented to the Membership be approved. MOTION: Be it moved, to acknowledge Jean Lindsay for her dedication and contributions to the RSCDS Toronto Association, that she be awarded an Honorary Life Membership. We dance at concerts, festivals and multicultural events as well as in seniors' residences, schools, public halls, weddings and anniversaries. • Tartan Day, April 6: an opportunity to showcase the national dances of Scotland -- from elegant strathspeys to lively jigs and reels. • We can include ceilidh and audience participation dances. To book the Demo Team for an event, or make other inquiries, contact Stella Henderson (416) 498-1940. Join up and perform at many interesting events and locations. Info here.